According to a 2002 study by the University of California, approximately 1.6 million Americans that live outside of an institution use wheelchairs. Of those individuals, sufferers of Arthritis represent the largest group of wheelchair users, representing approximately 10.5 % of all wheelchair users. Increasing accessibility is very important for these people and of all areas, the stairs are often the most difficult to access. To overcome the obstacle presented by staircases, some wheelchair users will install a ramp over or next to the staircase. This can increase accessibility, however depending on the location, they can require a lot of space, require major modification to the building, must be made out of poured concrete, or are very expensive. In addition to these difficulties often presented by using a ramp, they are often difficult to use or require a good deal of effort. Wheelchair lifts present an alternative to wheelchair ramps and can provide a quick and efficient way of accessing the stairs. These devices work on principals similar to that of an elevator, but do not require the expensive building modification an elevator would require to install. There are two main types of wheelchair lifts available. 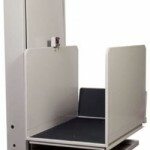 The vertical platform lift is probably the most well known and well recognized. These types of wheelchair lifts are installed next to a staircase and provide a platform that the wheelchair or mobility scooter can be driven onto. Once the wheelchair lift is on the platform, an electrical motor raises the platform so that it is parallel with the top landing of the stairs. Due to the way a vertical platform lift works, it is well suited to outdoor staircases, like those you would find on the front of a home. For indoor staircases, a vertical platform lift will not always work though, so in these cases an Incline Platform Lift can be used. Incline Platform Lifts use a track system, but like vertical platform lifts, they also provide a platform for the wheelchair or mobility scooter to be driven onto. The platform moves along the metal track, which is attached to the wall, and travels the length of the staircase. This differs from a vertical platform lift, which is designed to move only straight up or down. In regards to the way they operate, Incline Platform Lifts are actually very similar to stair lifts, which also use a track system. This is one reason that the incline platform lift presents such a verbose solution to those who need full access to the stairs. However, a larger staircase is usually required, so an Incline Platform Lift might not be the best solution for narrower residential staircases. For use in the homes, businesses, schools, and churches, vertical platform lifts and incline platform lifts greatly improve accessibility for people using wheelchairs or mobility scooters. In many cases, these devices can add much accessibility, without requiring any major modification to the existing structure and for much less than other lifting solutions.